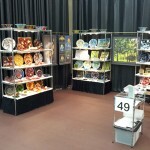 Last weekend the Lake Naomi/Timber Trails community near Pocono Pines played host to a Fine Arts and Crafts Show where we exhibited. 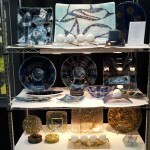 The show was a fund-raiser for an area food bank as well as an excellent opportunity to show our work to people who appreciate art and fine crafts. An exhibit requires several hours to set up. Lake Naomi’s committee arranged to have young men ready to help exhibitors “load in” and they made quick work of hauling stuff from our vehicle to the assigned booth. The helpers were friendly and strong; they generously offered to do more, but we reserved unpacking to ourselves. In less than three hours most of the hall was transformed and our own booth looked pretty good. 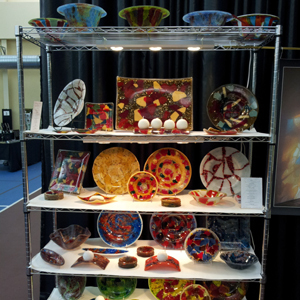 Next morning we were ready for visitors when the doors opened and spent the ensuing six hours visiting with people about how we make our fused glass wares as well as about stained glass installations. Everyone loves the beautiful colors and the depth of our glass fusing. It seems to us that customers are drawn to colors first, then to dish styles. So we organize our wares by color groups. 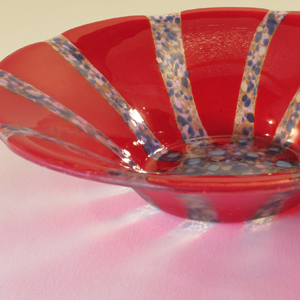 Red ware draws the most attention or at least most people’s first attention even when they ultimately choose to buy something in another color. One advantage to exhibiting as a couple is that during less busy periods we can take turns walking around the exhibit hall to see other artists and craft-persons’ work and learn about their processes. Whether they are painters, wood-workers, or weavers, they have something to teach us. Last Saturday we each got out for a walk, after the rain ended, and enjoyed the community “leisure trail.” Even found blackberries ripening along the way. Lake Naomi’s show lasts only one short day but most shows are longer. Whatever the length, all good things come to and end and we start repacking the glass and display materials, a labor of a couple hours. Young women appeared this time and helped disassemble shelving racks. They also toted most of our boxes out to the vehicle, a real blessing because by that time we were weary. It is always long after dark when we get back to the Studio following a show. 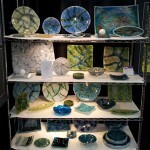 Despite the work involved, exhibiting is our best opportunity to talk with folks about our work. We learn what people like and we bring home a good deal of affirmation. 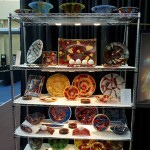 Last weekend a fellow glass artist bought glass from us, and that’s a fine compliment. Looking at our glass through other people’s eyes and mingling with other creative people boosts our creativity. Driving homeward there’s a lot to talk about. The Lake Naomi experience packed two 90 minute round trips, five to six hours of setting up and taking down, and six hours on our feet into a 23-hour period. Yes, we were tired afterward but eager to get back into the studio. We’re already looking forward to at least two more shows before the end of the year: November 23-24 in Buckingham Springs and Thanksgiving weekend at Skytop Lodge.